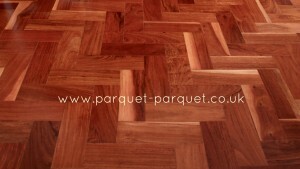 Rhodesian Teak (Baikiaea plurijuga) is a very handsome parquet is from Central Southern Africa. Grown in Angola, Botswana, Namibia, South Africa and Zimbabwe. Also known as Gusi and Mukusi as well as Zimbabwe Teak or Zambesi Redwood. It is not true teak (tectona grandis), it is something far better looking. We find it in buildings dating from the 1920s to 1950s after which it seems to have gone out of parquet fashion. However lately we see it being used a lot, especially commercially, since it is such a hard-wearing timber it is a perfect choice. Rhodesian Teak is a hard timber with a fine grain, which has a high resistance to wear. When freshly cut, the heartwood is brown with irregular dark markings eventually turning dark red to dark red-brown and purple upon exposure and a contrasting pale wide sapwood. It doesn’t have any scent when sanded, it will however glue easily and takes a finish well. It will polish well to a light lustre with a superb depth and range of colour. Rhodesian Teak is a heavy weight and dense timber. Pre-drilling is recommended when fixing. As it is such a hard timber it does have a blunting effect on saws and other cutting machinery. But it is all worth it!